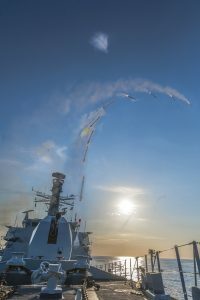 Marshall Aerospace and Defence Group (Marshall ADG) have been awarded a £13.5 million contract by MBDA for the manufacture of the Common Anti-Air Modular Missile (CAMM) Canisters for the next-generation Sea Ceptor and Land Ceptor weapon systems. Picture, courtesy of MBDA, is an image of Sea Ceptor being fired. Through this contract, Marshall ADG will deliver Canisters as a semi-installed unit to MBDA. In addition to the £13.5m contract award, further options exist for future CAMM requirements plus the potential for a CAMM Extended Range Canister currently in development. The contract will be fulfilled from Marshall ADG’s Advanced Composites base in Kirkbymoorside, North Yorkshire where Marshall ADG has invested over £7.5m in composite manufacturing facilities, engineering capabilities and training since 2013 to support the growing demand for innovative advanced composite technologies. Marshall ADG also supports the Land Ceptor programme through its design, manufacture and integration of sub-systems equipment for the Land Ceptor Fire Unit Support Vehicle (FUSV).